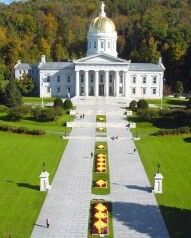 The State of Vermont recently passed legislation that established the State Energy Management Program (SEMP) within the Department of Buildings and General Services to administer the interest of the State in all energy management measures in State buildings and facilities, the implementation of energy efficiency and conservation measures, and the use of renewable resources. The SEMP is implemented through two revolving funds that are used to finance energy management measures in State buildings and facilities. State agencies and departments may apply to fund energy management projects through these revolving funds. The first fund, the State Resource Management Revolving Fund (SRMRF) is available for resource conservation measures. The SRMRF has $1.5 million. The other fund, the State Energy Revolving Fund (SERF), is available for energy efficiency improvements and the use of renewable resources. The SERF will add another $8 million to the state’s ongoing efforts. Vermont State owned building utility expenses are currently $14 million every year. The new funding aims to reduce the annual energy usage by 5 percent.